A beautiful, fair-haired young woman with exotic eyes enters 221B Baker Street. Her father, his closest friend, and a young medical student have all died in the past two weeks. Each body was found soon after death but with rigor mortis already set in. She believes they were murdered and seeks the help of Sherlock Holmes. The mystery that led to their deaths began fifteen hundred years ago when the sacred tooth of the Buddha was brought to Ceylon. Since then it has never left the Temple of the Tooth in Kandy where it has been guarded and worshiped. Now it is coming to London, a triumph of the Empire. But what if it is stolen? It would be a disaster. And the murders area all tied to it. 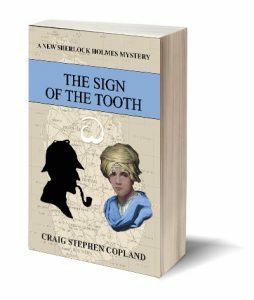 Sherlock Holmes and Dr. Watson, aided by the young woman, Mary Morstan, the Baker Street irregulars, and the mysterious dark-skinned irregular known as The Injin, must save the Tooth, and the Empire, and put the murdering scoundrels out of business. Dr. Watson, ever the gentleman, cannot help but desire to help this lovely young woman who is in fear for her life. And there is something else he cannot help either. The story is inspired by the original Sherlock Holmes mystery, The Sign of the Four. The New Mystery borrows the same characters, the same exotic origins, and the same setting in Victorian London, but then take the reader on an imaginative journey spanning over a thousand miles and half the globe. Fans of Sherlock Holmes will enjoy seeing their beloved characters in an entirely new murder mystery.